The First Presbyterian Church of Raleigh, North Carolina has an important presence as a leading community of faith in North Carolina’s capital city. This book examines the history of the church from its birth in 1816 to present. It is comprehensive and contextualized within the broader national, state, city, and denominational history over the last 200 years. Through the years the church has been the spiritual home for numerous leaders within Raleigh’s business community. Several governors have been counted among its membership, along with other important members of the state’s political and legal communities. Its pastors have been among the most important Presbyterians in the state making this church one of the top Presbyterian congregations in the South. The church has also been an important resource for the city. When the State House, located across the street from the church, was destroyed by fire in 1831, the Legislature and Supreme Court used the church building until a new capitol could be completed in 1840. The 1835 Constitutional Convention also convened in the church’s building. 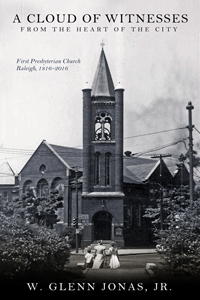 The First Presbyterian Church served as the “mother church” for the establishment of other congregations in the Raleigh area. This book will be helpful to anyone interested in the Presbyterian movement in Raleigh. Readers interested in the rich history of Raleigh will also find valuable information.